The Rangers first power play was a good one. Boyle did a great job screening Holtby but they were unable to convert on their shot attempts. The Capitals had the second best power play in the League coming into this game, but the Blueshirts did a good job killing off their first power play. The Rangers had another power play chance but yet again couldn’t convert. The second Capitals’ power in play led to the first goal of the game. A disastrous giveaway by Girardi with just under 15 seconds left in the period put the puck on Ovechkin’s stick, who deposited it into an empty net. Lundqvist was on the opposite side of the net at the time of the giveaway and was unable to recover. The Blueshirts third power play of the game, early in the second period, proved to be ineffective once again. The teams traded breakaways, but it was Williams who scored the goal that put the Caps up by two. Lundqvist made an original save, but somehow the puck trickled under his pad. Through Holtby’s great play, the Capitals maintained their 2-0 lead through the end of the second period. In that period, the Rangers created numerous 3 on 2 opportunities but were denied each time. With a pad, with a stick, or with a glove, Holtby continued to be the best player on the ice. In addition to eighteen shots on goal through two periods, the Rangers also missed the net fourteen times. Perhaps Holtby was forcing them to try to create a perfect shot. In the third period, Oscar Lindberg’s eleventh goal of the season got the Rangers to within one goal. The puck was held in the zone by McDonagh, who fed it to Moore. Moore sent a beautifull pass across the ice and set up Lindberg. He ripped a shot past Holtby and sounded the goal horn. Shortly thereafter, the Caps had a chance to extend their lead in a crazy bounce, but the puck rang off the post. They also had a power play opportunity, but the Rangers killed it. Sometimes, one of the greatest ways to get a momentum swing is a penalty kill, and Kevin Hayes swung the momentum when he tied the game at 2. 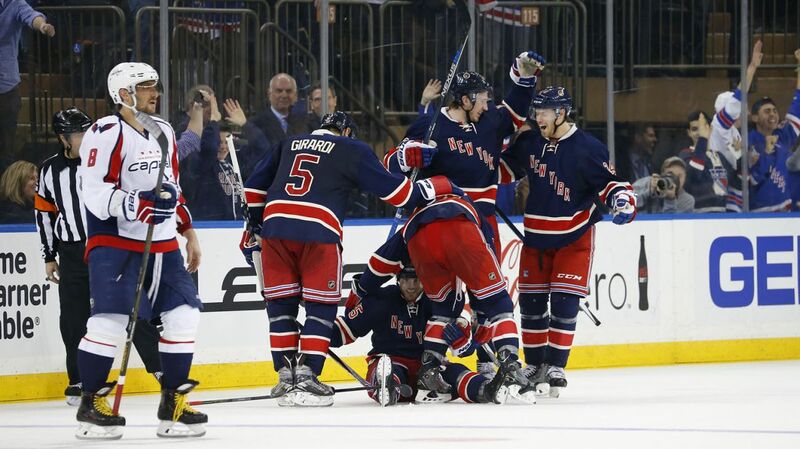 Right after killing off the penalty, the Rangers rushed down the ice. Brassard passed it back to McDonagh, and he fired a shot on net. 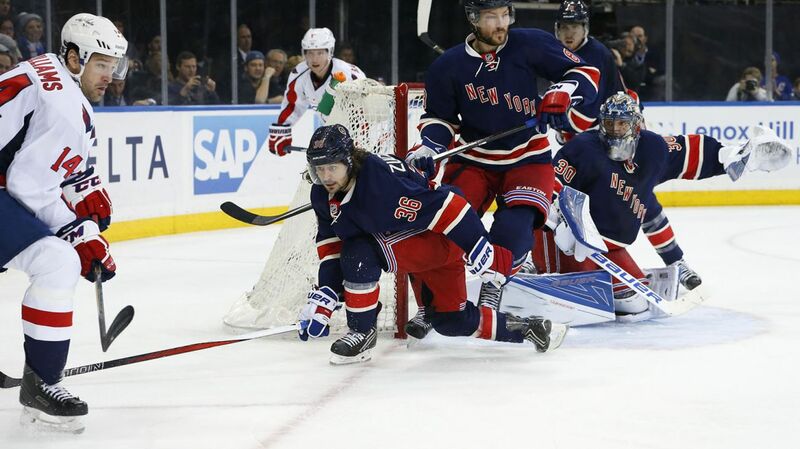 Hayes found the loose puck and slid it past Holtby’s outstretched pad for his first goal in 18 games. Minutes later, the Rangers held the puck in at the blue line again, and it led to the go-ahead goal. Stalberg deflected the puck in front of the net from a point shot from Yandle. The play was reviewed in a coach’s challenge for offsides, but the call on the ice stood- it was a good goal. The Caps had a chance to tie the game, but Burakovsky hit the inside of the crossbar minutes later from close range, and the game remained 3-2. The Caps pulled the goaltender, and Nash had a chance to put the game away but missed the net. The Capitals raced down the ice and after a scramble in front, Backstrom tied the game with 5.6 seconds left in the period. Nobody picked him up in front of the net, and Backstrom was able to score off of a rebound. In overtime, Derek Stepan had a great opportunity to hand his team the home ice win. He got the puck in front of Holtby with practically an open net, but was denied an easy goal by the reaching pad of Holtby. The Caps regained possession and Oveckin skater end to end with the puck. He snapped a shot past Lundqvist, handing the Rangers a painful loss. To come back from a two goal deficit in the third period, take the lead, and then give it up with five seconds left makes the loss one of the most heartbreaking of the season, especially considering the opponent. Overall, the Rangers played a sound hockey game, and if they continue to play this way, it should lead to good results. Despite the two goal hole, the Rangers dictated play for the majority of the game and spent a good amount of time in the Capitals’ zone. They finish their three game homestand against the Bruins on Monday night and look for a win. Posted on January 9, 2016, in Game Recaps and tagged Alain Vigneault, Antti Raanta, Chris Kreider, Dallas Stars, Dan Boyle, Dan Girardi, Derick Brassard, Derick Stepan, Dominic Moore, Dylan McIlrath, Emerson Etem, Henrik Lundqvist, Holtby, Jesper Fast, JT Miller, Justin Williams, Keith Yandle, Kevin Hayes, Kevin Klein, Kuznetsov, Madison Square Garden, Marc Staal, Mats Zuccarello, MSG, New York Rangers, New York Rangers blog, Nicklas Backstrom, NYR, Oscar Lindberg, Ovechkin, Rangers, Rangers blog, Rick Nash, Ryan McDonagh, TJ Oshie, Viktor Stalberg, Washington Capitals. Bookmark the permalink. 2 Comments. Good article – I agree that this is the most disappointing loss of the season, but they are playing better.